Glutathione is an essential molecule for your health and it is known to prevent conditions such as cancer, heart disease and illnesses associated with aging such as dementia. 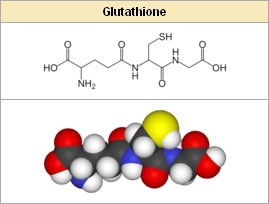 Glutathione is also used to treat various conditions such as autism and Alzheimer’s. Described simply as GSH, Glutathione acts as your body’s antioxidant and, it is naturally produced in the body. Unfortunately, its production in the body depletes and this can be attributed to factors such as toxins, radiation, pollution, aging, stress, infections, trauma and certain medications. There are various reasons why people take glutathione. Some people take it for its antioxidant properties while others will take it as a detox substance. Cancer patients will take glutathione to relive the side effects of chemotherapy and, it is also taken by patients undergoing radiation. People also take glutathione when they are trying to treat infertility, a weak immune system and a host of other conditions. As we age, our bodies slow down even with the production of glutathione and this may lead to poor health. Lower glutathione levels have been associated with many of the conditions that affect older people. Glutathione is essential in ensuring that other sources of antioxidants like vitamins C and E, carotenoids and selenium are absorbed properly into the body. However, it is not just a source of antioxidants. It is essential in facilitating other biochemical functions in the body such as utilizing energy, detoxification, combating diseases and enhancing the work of the immune system. This molecule is also involved in repairing and building body tissue, producing body chemicals and protein essential for the body’s immune system. A deficiency of glutathione could lead to oxidative stress which increases the risk of developing conditions such as stroke, diabetes, cancer, heart attack, sickle cell anemia, cystic fibrosis, liver disease, Parkinson’s disease and Alzheimer’s. It is also widely used to reduce the harsh side effects of chemotherapy. In fact, healthcare providers provide glutathione intravenously or through an IV when administering chemical cancer treatments to reduce the side effects. That said; more evidence is required to rate the effect and usefulness of glutathione in treating heart disease, lung disease, asthma and other illnesses. Bioactive whey protein is a good source of amino acid and cysteine building blocks which promote glutathione synthesis. Exercise is a good way to enhance your immune system and build your antioxidant defenses. The body digests protein and this means that taking glutathione supplement on its own may not be as useful as you want it to be. However, when you work out you are recycling the different nutrients of glutathione which are more useful for your body. Note: Instead of glutathione supplements, you might want to go for glutathione supporting supplements that you can take while exercising such as fish oil and multivitamins. You are advised to engage in 30 minutes of vigorous exercise daily, good examples being jogging, walking and playing sports. Strength training should be done 3 times a week, 20 minutes each session. Fresh fruits and vegetable are filled with nutrients that help your body produce glutathione. Eat vegetables that are rich in sulfur such as onions, parsley and garlic as well as cruciferous vegetables. Avocadoes, tomatoes and squash are also recommended. Precaution: How you prepare the vegetables matters. Cooking your vegetables diminishes the glutathione content by as much 30% to 60%. Canning eliminates glutathione completely. You’ve probably heard that stress is not good for you. Well, it’s not good for your glutathione levels either. Chronic low-levels of stress is one of the simple ways of depleting your glutathione levels. Your body is not designed to keep up with prolonged adrenaline and cortisol production which are brought about by stress. To increase your glutathione levels, you need to find a way of reducing your stress levels. Some great stress reducers are yoga, laughter, reading or spending time in the great outdoors. Reducing stress is of course easier said than done, but it is essential in increasing your general wellness. Glutathione has many uses and it all depends on how it is administered. Intravenous Glutathione is taken intravenously to reduce the side effects of cancer treatment - chemotherapy. It can also be administered to treat anemia in patients with hemodialysis, diabetes, Parkinson’s disease, atherosclerosis and infertility in men. Orally Glutathione can be taken orally as treatment for glaucoma, cataracts, asthma, cancer, heart disease, high cholesterol, liver problems, memory loss, Alzheimer’s disease, osteoarthritis, chronic fatigue syndrome, AIDs and other conditions. It’s also used for anti-aging purposes. Inhalation Glutathione can be inhaled to treat lung disease and other conditions. It’s important to note that there is still insufficient evidence supporting the use of glutathione. Dosage is usually determined by the healthcare provider depending on the condition being treated or its use. Glutathione has been linked with low zinc levels especially when taken over a long period of time. When inhaled, glutathione may trigger asthma attacks and bring about wheezing. It’s not clear if glutathione is safe to take when pregnant or breastfeeding, it’s therefore best to avoid it. People who are sensitive to glutathione also should avoid taking it. If you are taking any supplements including all-natural supplements, make sure that you inform your doctor. This way, you can steer clear of any negative side effects that may arise due interactions of glutathione and other substances.